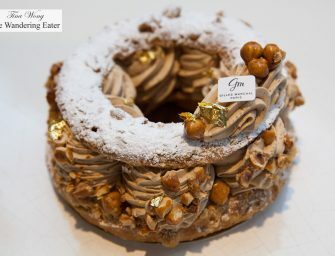 [Translate] Christophe Adam, pastry chef and owner of L’Eclair de Génie in Paris’s Marais district (and there’s other locations around the city). Adam has transformed and modernized the classic French éclair into a dessert that is fresh and appealing. 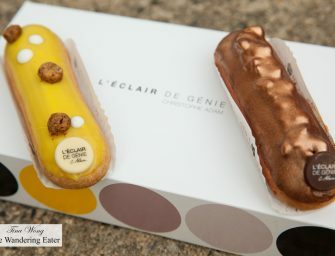 He dresses his éclairs in stunning rainbow colors, finishes them off with edible powdered silver, and throws into the mix fun flavors like yuzu, salted caramel, orange pistachio, and even caramel popcorn. Basically, he’s made the old éclair cool again. What you won’t find is any other pastries here since this brand is all about éclairs, chocolates (that are boxed or..
[Translate] Part of the reason why I visited Patisserie Gilles Marchal is because I have ment and briefly hung out with Gilles a little more than six years ago when he was the Creative Director of La Maison du Chocolat (it was m first time visiting Paris and you may read that post here) and curious to know how’s life after the mentioned position. Prior to his post at LMDC, he was the pastry sous chef at the Crillon, and executive pastry chef at the Plaza Athenee and Le Bristol. 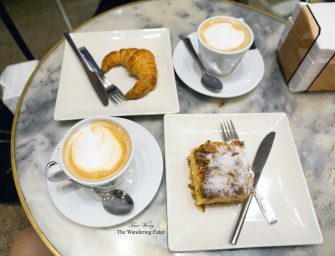 We found out toward the end of our visit that..
[Translate] If you have been reading this site long enough, I am fans of Maison Kayser. I am excited that this amazing international, French-based patisserie and café brand finally opens in the Upper West Side. The new location is at 2161 Broadway on the corner of 76th Street. It’s dangerously close to Fairway that I would extend my grocery shopping trip and carry a larger haul with their delicious, organic, artisanal loaves of bread and pastries. This new location is beautiful that my recent Saturday morning, the morning light filtering through the large windows just cast a gorgeous shadow on..
[Translate] Ladurée opened its second U.S. location and finally, it has their legendary dining-in café and tea room beyond their takeout baked goods section. The entire venue is gorgeous and definitely reminded me of their Parisian location I visited and ate at. There are two themed salons, one inspired by Madame de Pompadour (the pastel green room with the gorgeous vintage chandelier, fireplace, custom marble floors and opens to an outdoor garden), the other by Madeleine Castaing, can also be reserved for private events. Ladurée SoHo’s salon inspired by French antique dealer and interior designer, Madeleine Castaing contains a plush..